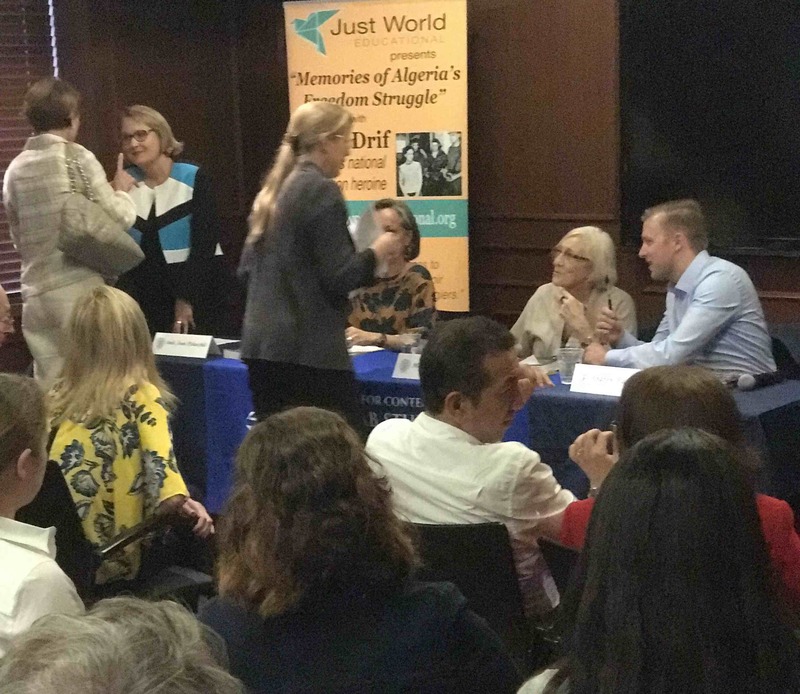 Zohra Drif, a key heroine of the actual 1957 “Battle of Algiers” came to the United States in late September to start sharing her memories of her country’s much-acclaimed freedom struggle. Her speaking tour on that theme, organized by Just World Educational, has taken her to Washington DC and New York City so far. Soon, she’ll be traveling to Cambridge, MA, where on October 2 she’ll be speaking at Harvard’s Kennedy School of Government. Mme. Drif’s events have all been fabulously successful. She launched her tour at the Woodrow Wilson International Center for Scholars, in Washington DC, where her event was organized by the center’s Africa Program. She was welcomed to the center by Africa Program head Dr. Monde Muangwa. David Ottaway, who had served as the New York Times‘s correspondent in Algiers from August 1962 through 1965, then introduced Mme. Drif’s presentation and led the discussion of it. Mr. Andrew Farrand, who had translated Mme. 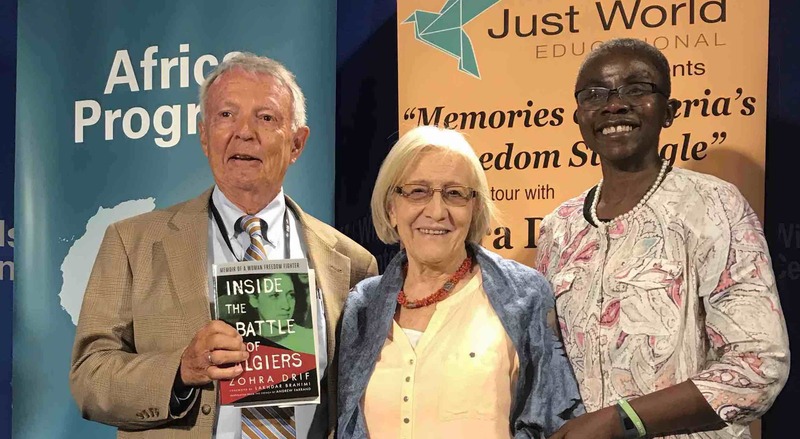 Drif’s newly released memoir, Inside the Battle of Algiers: Memoir of a Woman Freedom Fighter, from its French original, provided real-time interpretation between her and the English speakers in the audience– at the Wison Center and at all last week’s other events in Washington DC and New York. Zohra Drif speaks at Washington DC’s Wilson Center, with Andrew Farrand, doing the interpretation. One was the strong sense that she, like other Algerians, acquired at a young age, that the Algerians were people living at home in their own country and the country of their proud ancestors, while the country’s French rulers were outsiders who had come merely to occupy and oppress the country’s rightful owners. She said this strong sense of Algerians’ history and place in the world was transmitted particularly strongly by the children’s mothers and grandmothers– women who often had to struggle hard and raise their children on their own, as so many men had been deported, killed in struggle, or were otherwise not able to be at home. The other aspect of the FLN’s struggle that she talked about was the necessity that the FLN’s leaders and activists had seen, of taking up arms against the French, given that all the earlier attempts the Algerians had made to challenge the French using political means, or via mass nonviolent actions, had been met with brutal repression. Mme. Drif interacting with her admirers, after the Wilson Center event. After the event, a crowd of attendees gathered around the table at which Mme. 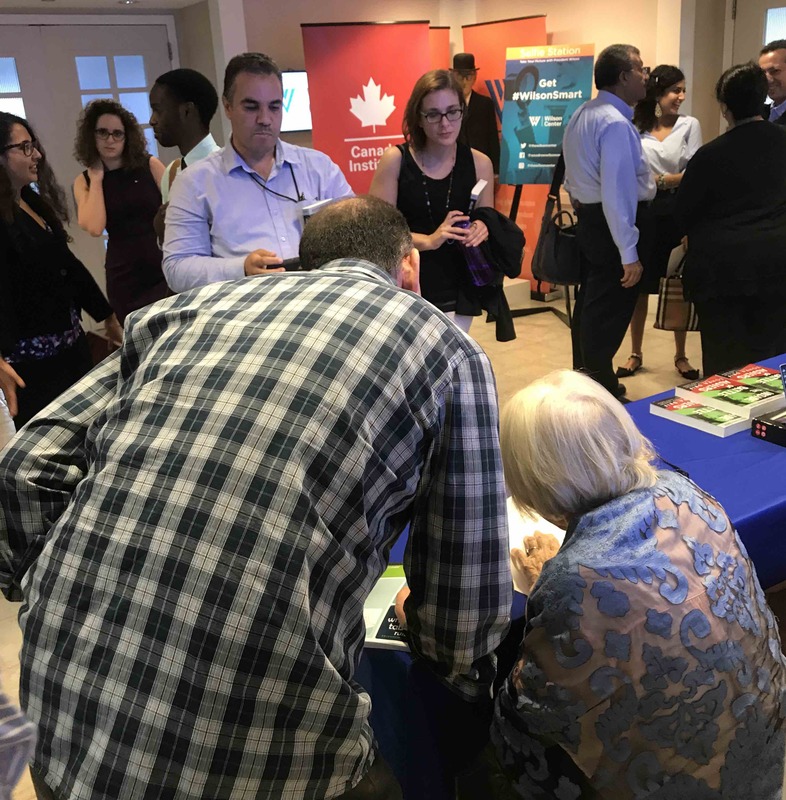 Drif was signing copies of her newly released, English-language memoir, Inside the Battle of Algiers: Memoir of a Woman Freedom Fighter, very eager to talk to her and take selfies as she signed their copies of the book. A journalist from Al-Horra television was able to take her away for a few minutes to record the interview with her that he inserted in this report on the event. Our wonderful partners at the Wilson Center later published this short report of the event, which has a great little photo gallery embedded in it. The next day, Mme. 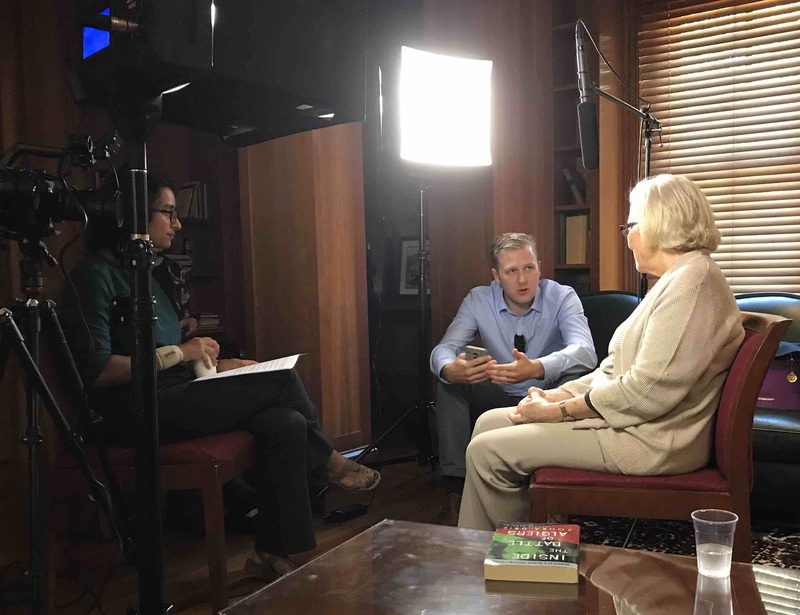 Drif went to Georgetown University, where first of all Rushika Shakhar of the Georgetown Institute for Women, Peace, and Security conducted videotaped interview for the Institute’s “Profiles in Peace” video series. The Georgetown video interview, Andrew Farrand translating. She then proceeded to the Mortara Center, where an overflow crowd awaited her. The crowd grew larger by the minute and soon filled a big anteroom, as well. 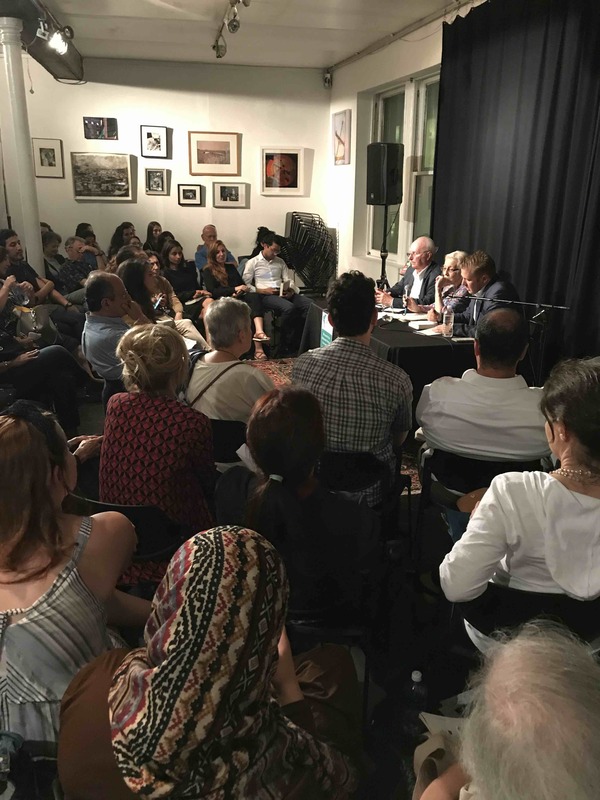 Her event at the Mortara Center was hosted by Georgetown’s very highly regarded Center for Contemporary Arab Studies, with a number of other university centers and programs co-sponsoring. Just before the Gerogetown program began. Behind the table, l. to r.: Amb. Joan Polaschik, Prof. Lahra Smith, Mme. Drif, Andrew Farrand. In front, with pony-tail, Prof. Rochelle Davis. 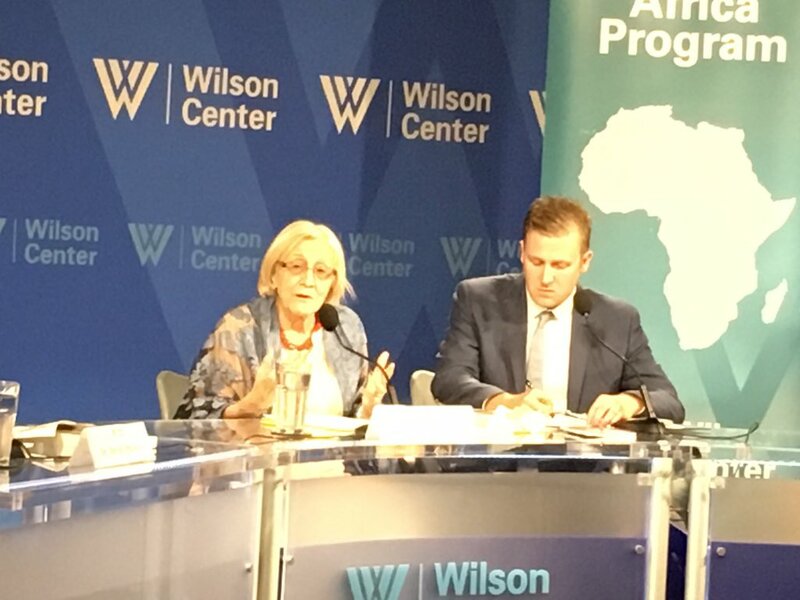 Georgetown’s Prof. Lahra Smith also gave a brief appreciation of the role of the Algerian freedom movement from the perspective of the influence it had upon other anti-colonial movements in Africa… Then, Mme. Drif spoke, in deeply engaged dialog with the overflow crowd there. At this event, she spoke very emotionally about the deep ties between the freedom movements in Algeria and Palestine, saying that (as it had been for the FLN) it was up to the Palestinians to decide what means to use to end the settler colonialism that has made their lives so unbearable for so many decades now. Midweek, Mme. Drif traveled to New York, where on Thursday she had two public events. At noon-time, she was featured in a program hosted by New York University’s Hagop Kevorkian Center for Near East Studies. Here, too, the very enthusiastic crowd spilled right out of the main room and filled up an overflow space; some attendees had to sit on the floor, stand at the edges, or perch on a spiral staircase as they sought to see as well as hear this historic freedom struggler. The front table at the Kevorkian Center event. The NYU program was introduced by Kevorkian Center head Dr. Helga Tawil Souri. Veteran Algerianist Dr. William B. Quandt was the main moderator and discussant, and Andrew Farrand did the translating. At the NYU event, Mme. Drif started by reading a short excerpt in English from her book. It addressed the crucial way in which the NLF’s leaders sought to place all the armed actions they carried out within the broader context of the politics of the struggle they were waging. Dr. Quandt then led a question-and-answer session in which many audience members also took part. That same evening, Mme. Drif spoke at a wonderful community event that had been pulled together at very short notice by the Lower Manhattan arts organization Alwan for the Arts. 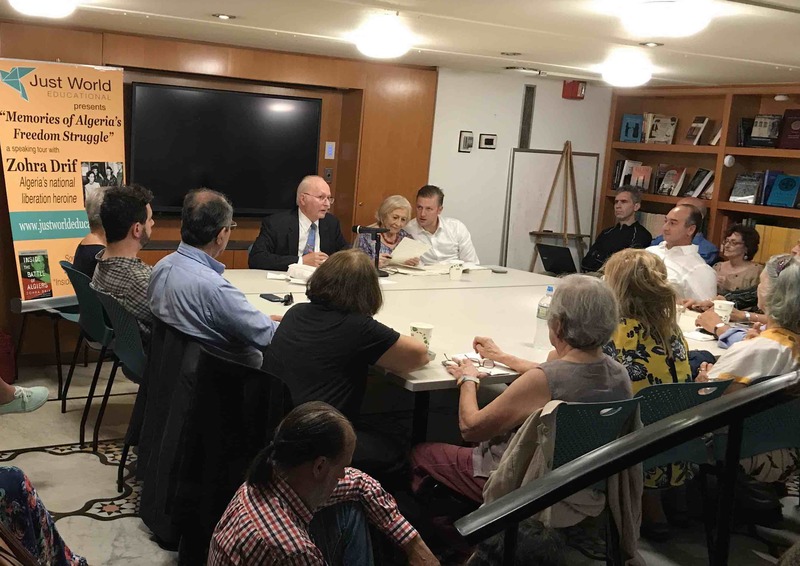 Numerous members of the Algerian-American community in New York City came to this event, to which Dr. Quandt and Mr. Farrand also contributed in much the same way they had at NYU. Quandt, Drif, and Farrand at Alwan’s beautiful space. Here, as at most of the earlier discussions, one theme Mme. Drif spoke about was the need for people of her generation of anti-colonial fighters to be able to tell their stories as widely as possible to the new generation of young Algerians who had never known French colonialism, and for the new generation to find the best ways possible to continue to contribute to their country’s wellbeing. For us at Just World Educational, working with Mme. Drif on this tour has been a very moving experience. We have been delighted to be able to (re-)connect a new generation of Americans with the imperatives of the anti-colonial and anti-imperialist struggles that seemed so much more vivid and present back in the 1950s, 1960s, and 1970s than they do to many US citizens in the present era. Mme. Drif will be in New York City for another week, and will then go to Boston/Cambridge, MA, where she’ll be speaking at Harvard on Monday, Oct. 2. There will be some additional events in New York before she leaves the city. Please check with our Events Calendar to learn details of these.